Cutting edge of teeth are worn flat by chewing or grinding. Remember to keep regularly scheduled hygiene appointments to check for cavities. Consider dental sealants to prevent decay, or a nighttime mouthguard if you experience grinding (bruxism). Jawbones supporting teeth or dentures can shrink by as much as two-thirds! 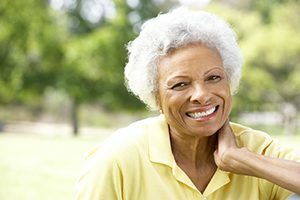 Loss of bone mass is a fact of aging, especially in women. When teeth are missing, osteoporosis (bone thinning) is accelerated. A diet rich in calcium (milk, green leafy vegetables, citrus fruits) can help put the brakes on bone loss. Tooth enamel becomes thinner, more brittle, more translucent. There are many way to strengthen a damaged or compromised tooth. Bonding, porcelain veneers, or crowns can all provide structural support and repair imperfections. Discolored or stained teeth can also be whitened! Xerostomia (pronounced zero-stomia), or “dry mouth,” affects people of a certain age. This can be a problem because lack of saliva can increase susceptibility to infection, decay, and gum disease. Dry mouth can also interfere with chewing, swallowing, even speaking. Xerostomia can be caused by prescriptions such as sedatives, heart and blood pressure medications, and others. Radiation therapy has the same effect as well. If you’ve got chronic dry mouth, consider saliva substitutes, sugarless gum or sugarless lemon drops. You may want to consult your doctor.